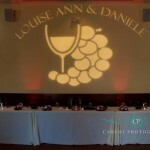 Light up your event with our unique "Gobo" lighting effects! Dazzle everyone at your wedding as you dance the night away on your personalized monogrammed dance floor. 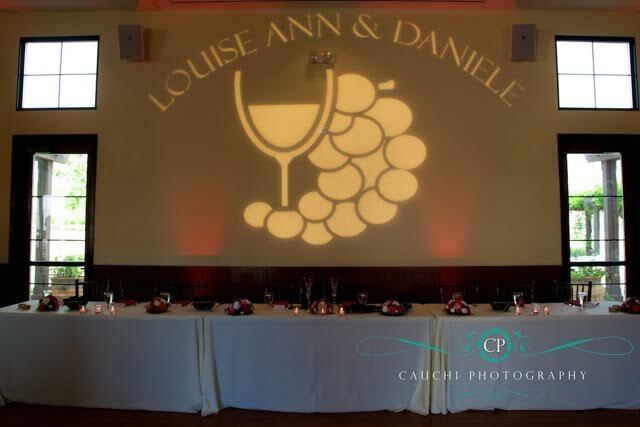 We can help you personalize your wedding reception by making a custom gobo that will project onto your dance floor or a wall at your banquet facility. We offer three choices to help you choose the perfect gobo for your event. Whether you choose the elegant black and white gobo, grey scale or the premium full color gobo, we are there to satisfy. Q. 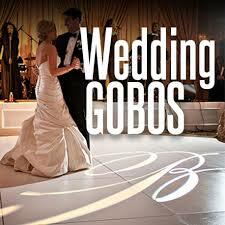 What is a gobo? A. A gobo (or GOBO) derived from "Go Between", "GO BlackOut" or "Goes Before Optics", originally used on film sets, is a physical template slotted inside, or placed in front of, a lighting source, used to control the shape of emitted light. Just like a slide that goes into a slide projector, a gobo goes into a light fixture. The light fixture has to be equipped with a special lens system for projecting gobos. Gobos have to withstand the extreme heat that strong light fixtures produce, that’s why they are made from heat resistant materials such as glass or metal. Q. Which gobo types are there? A. Metal gobos can only produce b/w images. These are thin metal foils with “holes” in them and the light shines through these holes. The holes are arranged in the desired pattern that you wish to project. 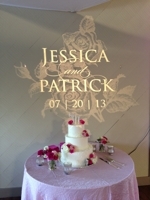 Glass gobos are glass wafers with the artwork etched on the surface. They can project much finer patterns than metal gobos and can project grayscale and colors - even photographic images. Q. 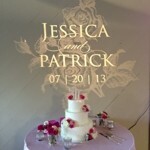 Can I use a regular light for projecting the gobo? A. You need a light fixture that is equipped with a lens system for projecting gobos. 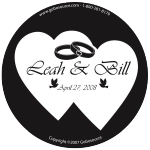 We offer this as part of the package"
If you would like a Custom Monogram for your Gobo Effect Light for your wedding or event, MWE recommends Mimi at Creative Designs by Mimi. "Mark, Thanks so much for the great job at our wedding. You were very helpful with all your suggestions before the wedding and a great help with all the coordination on the day of the wedding. The dance floor was rockin all night. We will definitely recommend you to anyone who is having a wedding or party. Ruth and I were very happy with everything and everybody that day. There was not one thing we would change."